Mark Cuban, owner of the Dallas Mavericks, makes it a point to read everyday. He says the same information is available to everyone. The difference between him and the former business competitors that he has blown out of the water, though, is that he takes the time each day to learn. You should take the same approach with your sports broadcasting. These eight books about sportscasting are some of my favorites and have earned a permanent place on my book shelf. Hands down, the best book ever written about how to succeed in our industry. Includes first person advice from some of the most successful voices in sports broadcasting – everything from how to be a better play-by-play guy or talk show host to how to get a job. Looks at the all-sports format in various market sizes across the country and what makes them successful. Focuses on unique personalities and programming strategies. I am a huge advocate of broadcasters varying their vocabulary, especially in play-by-play. It can be tough to do, though. After all, how many different ways are there to say bunt. Well, more than 20 are listed in this must-have for baseball broadcasters. And that’s not even including the Spanish variations on the list. The book also contains some fabulous, short anecdotes you can include in your broadcasts. Whether you are in your first job or you’re broadcasting on a national network, there are stories in here you will relate to. Mel Proctor names names as he share stories of the the hardships and frequent comedic episodes from his own career. It’s also the most aptly-titled book in my entire library. Anyone ever planning on attending baseball’s Winter Meetings for the purpose of trying to get a play-by-play job must read this book. Great first-hand accounts from past attendees about what to do and what not to do. Written by current NY Mets broadcaster Josh Lewin. Veteran network play-by-play broadcaster Gary Bender shares nearly 250 pages of an insider’s perspective about what to expect in your sports broadcasting career. To be honest, I found it a bit dry, but I must be in a small minority. Over the years, the only other book about sports broadcasting that I have heard referenced more often is The Art of Sportscasting. It’s not about sports broadcasting, but it’s another must-have for baseball play-by-play broadcasters. Full of absolutely fabulous and timeless anecdotes that you can pepper into your broadcasts. 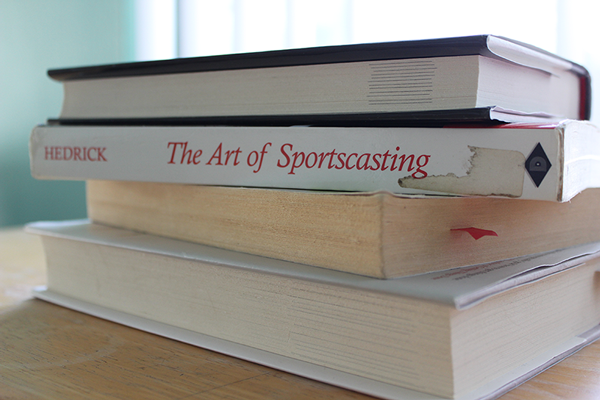 What are your favorite books about sports broadcasting? Add them in the comments section below or share them on Twitter using the tag #SportscastingBooks.